Normally on Sunday nights we do a pretty simple dinner. We usually have our biggest meal for lunch right after church. Today, however, we were way too tired to cook something in the afternoon. After getting home we headed straight for the bed and took a nap. It was a long weekend so we wanted to catch up on some sleep. 3 hours later we woke–groggy, surprised it was already 5:00… and pretty hungry. I flipped open my laptop and looked for pork chop recipes. I couldn’t find this apple pork chop recipe that I had done last time which turned out awesome, but I found a few others and decided since we had all the ingredients I’d just go for it. 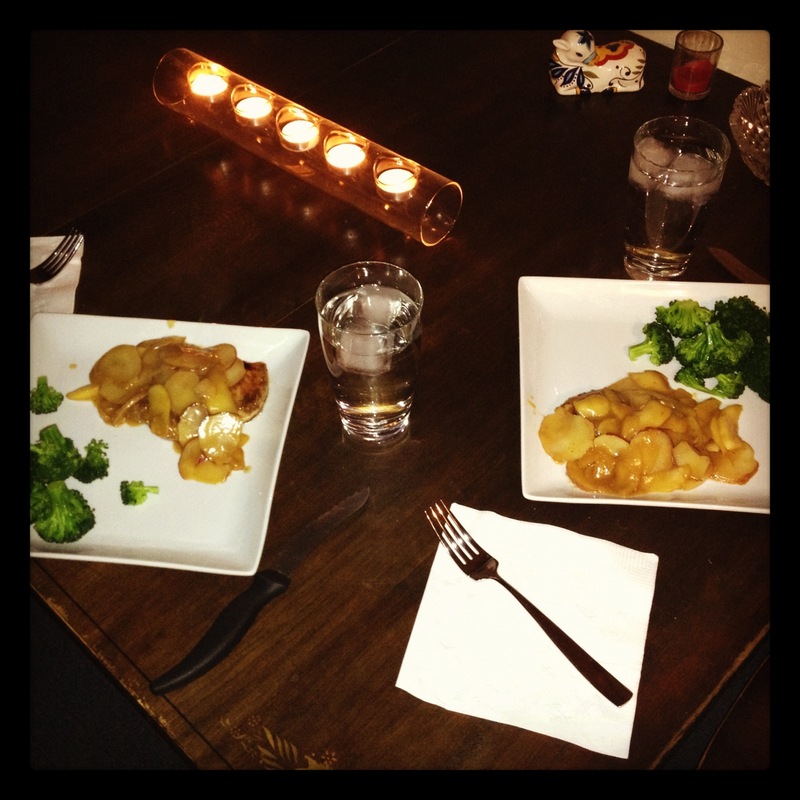 I found this recipe at Taste of Home: Stovetop Pork Chops with Apples. I went for it based on the prep time. This one said 30 minutes and it was also only for two servings. Definitely a good one you should try! We didn’t have any onion, but this turned out really well with apples, potatoes, a nice crispy but still tender chop, and a beautiful sauce to drizzle over everything. Reblogged this on UNIQUE GREETING CAKES. This looks great! I love pork and apples together.